It's going to be a gorgeous few days across the state. Temperatures for the Front Range will get even warmer, with plenty of melting! 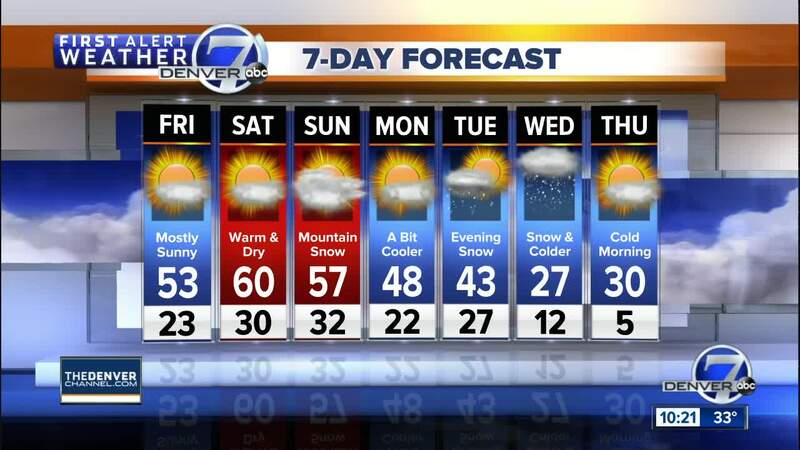 DENVER — It's going to be a gorgeous few days across the state. Temperatures for the Front Range will get even warmer, with plenty of melting! Early Friday will be seasonally chilly with lows in the 20s on the plains and 5 below to 10 above in the mountains. Highs will be in the 50s and will stay warm through Sunday. Expect mid- to upper 50s and even some readings around 60 degrees on Saturday and Sunday. Some high clouds will drift through the region, but no precipitation is expected through Saturday morning anywhere across Colorado. A quick-moving storm system will pass across Colorado Saturday night and Sunday with 4-8 inches of snow for the mountains. We'll likely just see an increase in clouds across the plains, but stay tuned for any changes! The recent cold wave in the Midwest does not mean the our world is not experiencing global warming due to the increase in CO2. This is simply a regional cold event. If you want to learn more about what is happening, read this essay on Denver7's Meteorologist Mike Nelson's Facebook page or scroll to the bottom of this page. The weather early next week will turn colder with snow likely in the mountains Monday through Tuesday. There will be a chance for snow in Denver late Tuesday and Wednesday.